Shown above are four of many 4-inch by 4-inch collages that created by Randel Plowman, an artist who lives and works in Bellevue, Kentucky. 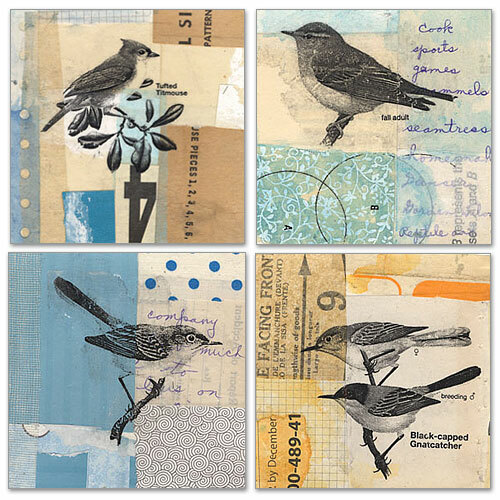 Randel creates lovely collages with scraps of mundane papers, hand writing notes and sketches, monotone photographs, and vintage bird drawings – all flowing magically together to create a sense of rhythm, balance and uniqueness in each piece. In the best collage tradition, Plowman's work reminds us of how Robert Rauschenberg could make a cigarette package look like high art. Visit Randel Plowman's collection of A Collage a Day project at his online blog, where he creates and posts a collage every day. You can see more of Randel’s collection of digital archival prints on his online galley at www.rplowmanstudios.com. Each limited edition high resolution print is signed and numbered in an edition of 25.